Councilman Bruce A. Kraus, born and raised in the South Side, began serving as a member of Pittsburgh City Council on January 7th, 2008. Bruce proudly represents Pittsburgh’s 3rd Council District while rounding out his duties as City Council President. District 3 is comprised of the following neighborhoods: Allentown, Arlington, Arlington Heights, Beltzhoover, Central Oakland, Knoxville, Mt. Oliver, Oakcliffe, South Oakland, South Side Flats, South Side Slopes, and St. Clair. Bruce was reelected to his seat in 2011 and sworn in for a second term on January 3rd, 2012. In January of 2014, Bruce was elected by his colleagues as the President of Pittsburgh City Council. Councilman Kraus’s personal history and extensive relationship with his constituents has played a key role in influencing a great deal of his work in local government. 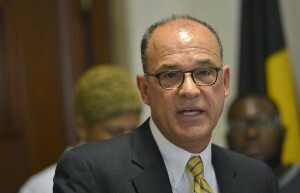 As Pittsburgh’s first openly gay elected official, Bruce has been a strong proponent of civil rights issues, including the Allegheny County Human Relations Commission – which serves to combat discrimination in housing, public accommodation, and employment – and the City’s first Domestic Partner Registry. As a Councilman, Bruce has sponsored a diverse and comprehensive package of legislation over the years. In response to concerns of his constituents, Councilman Kraus introduced the Responsible Hospitality Institute’s Sociable City Plan, which has worked to develop a comprehensive strategy to improve night life throughout Pittsburgh with an emphasis on public safety and transportation. He has also designed stricter open-container laws and passed the first municipal ban on public urination. Additionally, he sponsored the City’s Social Host Ordinance, tightening measures to prevent underage parties and protect students and residents from unsafe conditions often created by these parties. Bruce has supported also cosponsored legislation to require proper reporting of lost and stolen handguns in promotion of safe and responsible gun ownership in the City of Pittsburgh. Councilman Kraus is committed to the revival of the historic and traditional beauty of the many neighborhoods in Pittsburgh’s Community. He collaborated with Public Works in reopening the South Side Market House which is the largest senior program center in the City. Bruce assisted in securing funding and support for the $4 million renovation of the Carson Street branch of the Carnegie Library to better serve the surrounding community with state of the art library services. Councilman Kraus worked to secure space and open the Carnegie “Pop-Up Library” in Allentown to provide library access to the surrounding residents. Bruce Kraus has supported many projects in collaboration with local government offices, City departments, and neighborhood groups throughout District 3. Bruce helped to lead the conversion of a once blighted South Side property into the Riverfront Off-Leash Exercise Area, a dog park serving South Pittsburgh. He is currently collaborating in planning and investing in a $2 million renovation to the Knoxville branch of the Carnegie Library to also serve this hilltop community. He is actively working towards improvements in recycling and waste management and the elimination of abandoned cars and derelict buildings throughout the district. Outside of his roles of leading City Council and serving District 3, Bruce sits on the Brashear Association’s Board of Trustees, the Carnegie Library Board of Trustees, the Carnegie Mellon Board of Trustees, the Board of the Children’s Sickle Cell Foundation, the Board of Directors for the Institute for Research, Education & Training in Addictions (IRETA), the Board of Directors for the Oakland Business Improvement District (OBID), the Board of Trustees for the Pittsburgh Cultural Trust, and the Advisory Board to Shepard Wellness.